Leonardo probably drew this model of a war machine for a presentation to Ludovico il Moro, “The Moor”, Duke of Milan, around 1485. The drawing in the original manuscript therefore appears neat and well laid-out. The armoured car, like other inventions such as the scythed chariot, has a classical pedigree. Like other Renaissance artist-engineers, Leonardo looked to the classical world for inspiration. He would then go beyond classical models and devise his own solutions. Leonardo’s armoured car contained many light cannons. These were arranged on a circular platform which was based on four wheels and provided a firing range of 360 degrees. 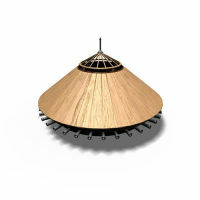 The whole platform was surrounded by a conical cover with a sighting turret at the top. At the centre of the car, two cranks were used to set the machine in motion. The project is technically unrealisable and the drawing also contains a mechanical error which prevents the car from functioning – the cams as drawn would turn the wheels in opposing directions. But this is a demonstration piece, not a working drawing for technicians. Many consider this armoured car as the precursor to the modern tank.